Variable song is series of high, thin notes usually followed by wheezy, downslurred note. Description: Male is glossy black with a white belly; bright orange patches on outer tail feathers, wings, and sides; white undertail coverts. 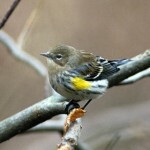 Female is gray-olive above; white below; yellow tail, wing, and side patches. Immature resembles female. Behavior: Often spreads its tail and wings while perched, showing off its conspicuous, colorful patches. 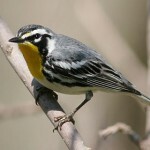 Habitat: Young or second-growth deciduous woodlands, moist bottomland woods, and near openings of mature forests. Where in Nebraska: Common summer resident in eastern counties, Pine Ridge area, probably the entire Niobrara Valley, and locally in the Sandhills. 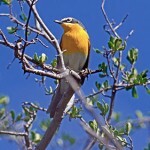 Nebraska Seasons: Common spring and fall migrant across the state. 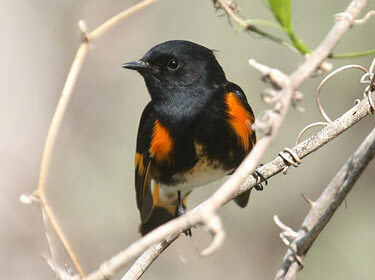 Fun Facts: American Redstarts are known in some areas as “latrine birds” because of their tendency to look for flies around outhouses and garbage dumps.